Did you know? Parents play the major role in a child’s emotional growth! As mentors we need to become aware of our own reactions, especially when things go ‘wrong’. Pay attention and encourage the on-going flow of creativity in your child. Give your child the most valuable gift – a positive attitude. If a child lives with criticism he learns to condemn. If a child lives with fear he learns to be apprehensive. If a child lives with pity he learns to feel sorry for himself. If a child lives with ridicule he learns to be shy. If a child lives with jealousy he learns what envy is. If a child lives with shame he learns to feel guilty. If a child lives with tolerance he learns to be patient. If a child lives with acceptance he learns to love. If a child lives with sharing he learns about generosity. If a child lives with honesty and fairness he learns what truth and justice are. Written many decades ago, the message is still true. What your child sees, hears and is witness to as he grow up – will impact his thinking and his life. 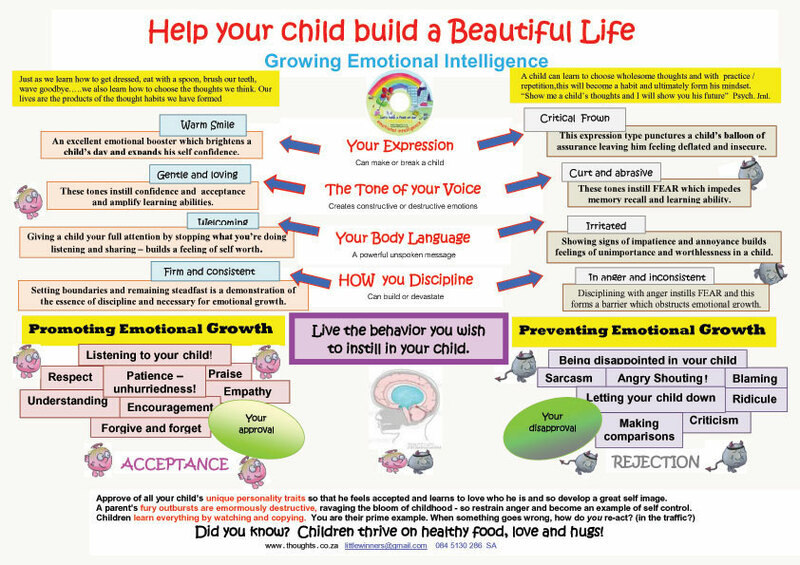 Free Download of the Emotional Growth Chart . All the products are available after the talks at discounted prices.